A visit to Edinburgh Zoo earlier this year gave Susan the opportunity to closely observe, sketch and photograph the penguins for which the Zoo is most famous. 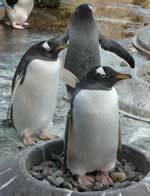 There are eighteen species of penguin in the world today and the Zoo has three of them:- King, Rockhopper and Gentoo. 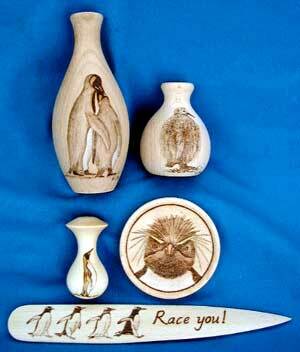 Susan has subsequently been inspired to create a new set of penguin designs for her pyrography work based on these. Penguins have been important to Edinburgh Zoo since 1914 (the year after it opened) when the first gift of a penguin was made by the Salvesen Whaling Company. The Zoo pioneered breeding techniques for penguins in its early years and in 1919 was the first place in the northern hemisphere to successfully hatch a king penguin chick. In 1992 it opened the world's largest penguin pool. The king penguin (adopted as the logo of Edinburgh Zoo) features on a new style of sycamore light pull in Susan's current range of hardwood products. This species is second in height only to the emperor penguin and her latest design shows this majestic bird in typical upright stance with head proudly erect. Susan also decided to depict this species on the two sizes of beech vase in her current range, feeling that on this occasion the designs would complement one another. A pair of adult king penguins affectionately caress one another on the taller 6" vase, while the smaller 3" version features the chick looking rather like an oversized pom pom with its thick coat of fur! Rockhoppers, so named because of the way they hop from boulder to boulder, can be rather aggressive towards other species and are kept in a separate enclosure from the other penguins at the Zoo. They do appear rather fierce with their small red eyes and distinctive plumage of long bright yellow feathers on their brow. Consequently, this is how Susan has decided to portray them in her design on a beech coaster. A colony of small grey and white gentoo penguins is a third species kept at Edinburgh Zoo. They build large nests mainly of pebbles. These become like a currency and if more than one individual sets its sight on the same stone, fights can often break out. A touch of gentle humour has been introduced to the design featuring four gentoos on a beech letter opener, perhaps in a race to acquire the most popular pebble! If you would like to discover more about Edinburgh Zoo, one of Scotland's most visited attractions, please go to www.edinburghzoo.org.uk.